On Thursday, September 18, the Department of Art History held its first Undergraduate Orientation hosted by Assistant Professor Elena Gorfinkel. Undergraduate students had the opportunity to meet professors, teaching assistants, and other majors and minors. Graduate student and teaching assistant Leigh Wilcox gave a brief exhibition tour of Unbelievable Cities: Etching of Whistler, Haden, and Pennell. 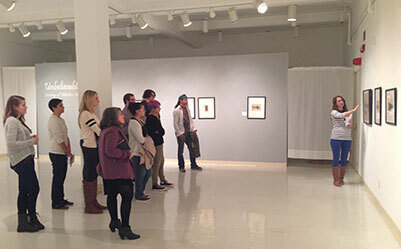 The undergraduate students also learned more about the UWM Art History Gallery, the UWM Art Collection, the major in Art History, and the minor in Art History.